Last weekend I attended my Husband’s work Christmas party and for the first time in my life, tried a cranberry salsa. I fell in love with the whole idea then and there. While I loved the dip that was served, it definitely had a LOT of sugar in it. 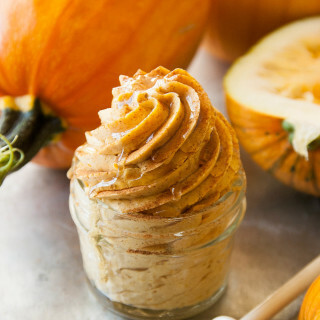 I wanted to make a healthier version that was just as sweetly tangy. 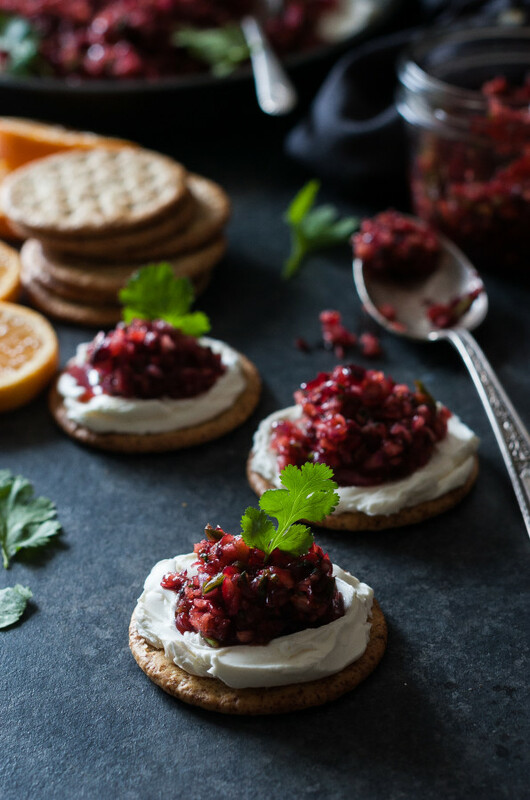 So today I whipped up this Cranberry Orange Ginger Salsa and served it over a Whipped Goats Cheese. The salsa itself is bright and tangy with added sweetness from honey, barely perceptible heat (I’m a spice wuss) from a little jalapeno, and holiday warmth from a few spices. 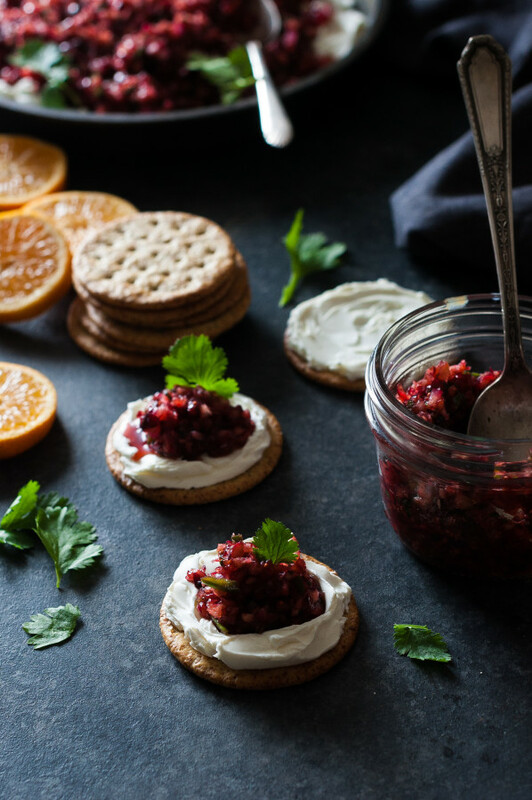 Fresh orange zest and ginger really make this salsa POP and compliment the cranberries so nicely. Goats cheese balances out this salsa perfectly. I whipped it with a cream cheese to tone down it’s strong flavor. You could use only goats cheese but I like a combination of both. 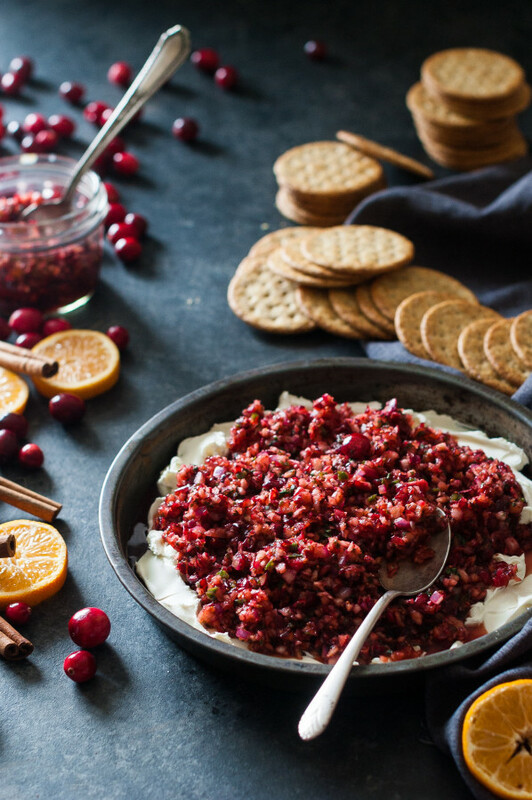 Serve this salsa at any Holiday event with a large stack of crackers and watch it disappear! 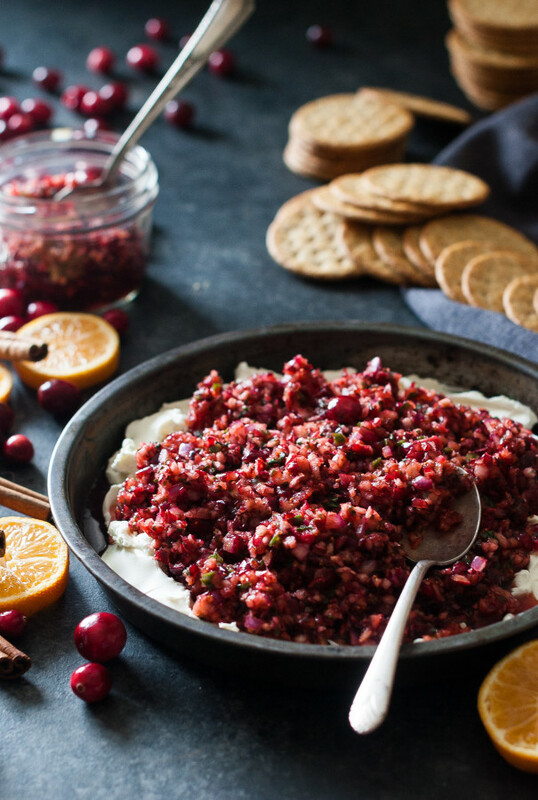 Place the cranberries, jalapeno, red onion, and cilantro in a food processor. Process just until the cranberries are chopped. Scrape the mixture into a mixing bowl. Add the orange zest, ginger, honey, lemon, cinnamon, cumin, and cloves to the mixture and stir until everything is well mixed. You can be done with the salsa at this point. OR, if your like me, you can let it sit for 30 minutes for all the juices to release, strain them and boil them down in a saute pan until they are thick and syrupy. Let the syrup cool and pour it back over the salsa. 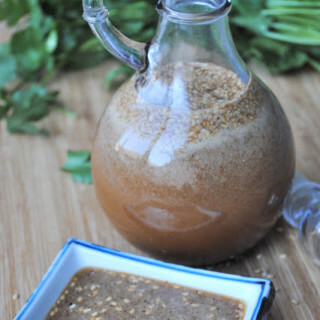 This will intensify the flavor and sweetness of the salsa and make it not so liquid-y. Place the goats cheese and cream cheese in a stand mixer and beat together until smooth and creamy. Scrape the cheese mixture onto a plate, smoothing across the plate at about a ½" thickness. 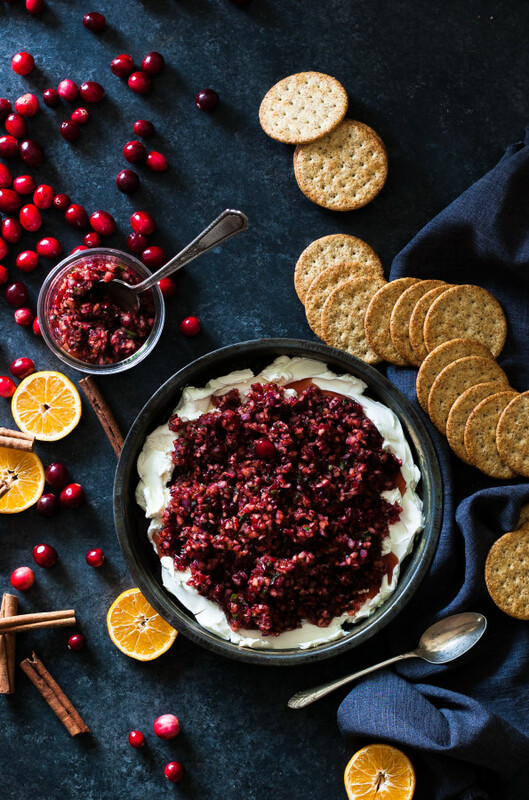 Spoon the cranberry salsa over the cheese. 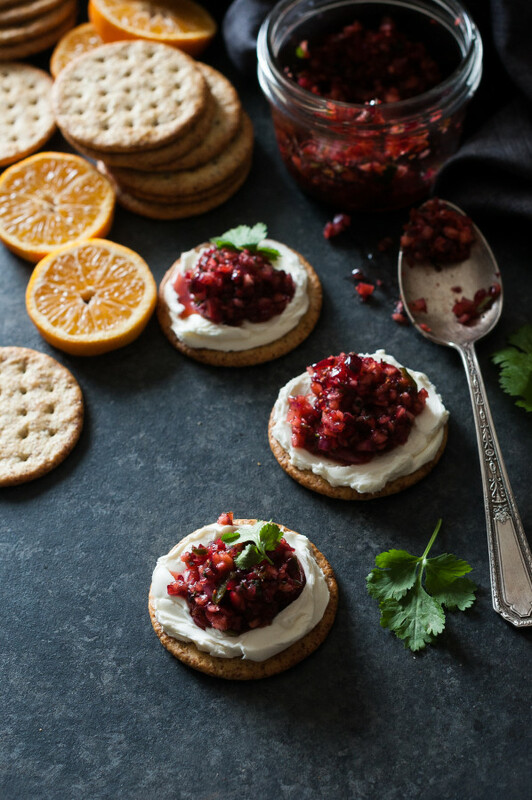 Serve chilled, spread on crackers.